Let’s pursue Example 1 from above. We have a hypothetical data file,truncreg, with 178 observations. We have a hypothetical data file, https://stats.idre.ucla.edu/wp-content/uploads/2016/02/truncreg.sas7bdat, with 178 observations. The outcome variable is called achiv, and the language test score variable is called langscore. The variable prog is a categorical predictor variable with three levels indicating the type of program in which the students were enrolled. These types of models can also be conceptualized as Heckman selection models, which are used to correct for sampling selection bias..
We will use proc qlim to run our truncated regression analysis. The variables langscore, prog are predictors in the model, while achiv is the outcome. We will specify that prog is a categorical variable using a class statement. The lb= option on the endogenous statement indicates the value at which the left truncation takes place. There is also a ub= option to indicate the value of the right truncation, which was not needed in this example. We will use the test statement to obtain the two degree-of-freedom test of prog. To save our parameter estimates in a dataset we can use later, we specify a dataset name using the outest option on the proc qlim statement. prog      vocation  0            0            .     .     . The output begins with summary statistics of the continuous outcome variable. The summary includes the mean of the outcome variable achiev, as well as the standard error of the mean. 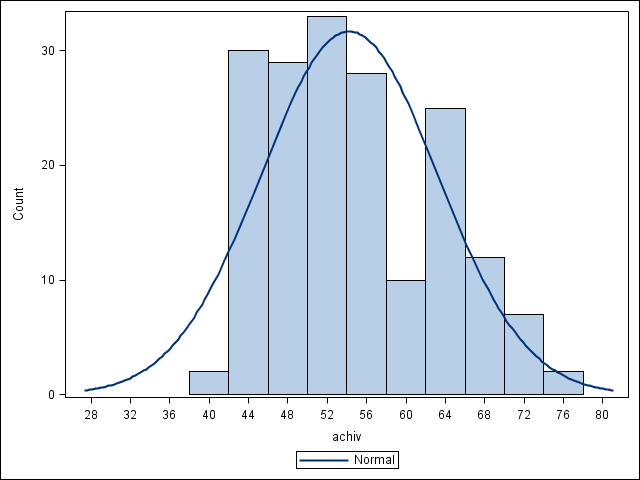 It also indicates that achiev is truncated at the value of 40. The Model Fit Summary table gives information about the model, including the log likelihood and the AIC. These values can be used to compare models. In the table called Parameter Estimates, we have the truncated regression coefficients, the standard error of the coefficients, the t-values, and the p-value associated with each t-value. The ancillary statistic _Sigma is equivalent to the standard error of estimate in OLS regression. The value of 8.76 can be compared to the standard deviation of achievement, which was 8.96. This shows a modest reduction. The output also contains an estimate of the standard error of _Sigma as well as a t-value and corresponding p-value. The variable langscore is statistically significant. A unit increase in language score leads to a .71 increase in predicted achievement. The effect of one of the two levels of prog is also significantly different from the effect of the reference level, level 3. Compared to level 3 of prog, the predicted achievement for level 2 of prog increases by about 5.20. To determine if prog itself is statistically significant, we can use the test statement to obtain the two degree-of-freedom test of this variable. In the final table in the output, we see that the variable prog, taken as a whole, is statistically significant (chi-square = 7.19, p= 0.0274). We may be interested in obtaining and comparing expected cell means. We can use the parameter estimates that we saved as a dataset with the outest option to get SAS to calculate these expected cell means in a data step. In this dataset we find that our parameters are named “intercept”, “langscore”, “prog_academic” and “prog_general”. The first row are the estimates themselves, while the second row are the standard errors. After computing our predictions, we can compare these expected cell means using test statements. Let’s compare predicted cell means, varying prog type while holding langscore is at its mean (52.011236 from the means table above). In the output we see our put statements, where we printed our estimates. Now using test statements within proc qlm, we assess whether these predicted means are different from one another. The effect of level “academic” of prog appears to be significantly different from the effects of levels “general” and “vocation” of prog, which do not differ. The qlim procedure produces neither an R2 nor a pseudo-R2. You can compute a rough estimate of the degree of association by correlating achiv with the predicted value and squaring the result. Below, we rerun the analysis, this time including an output statement to obtain the predicted values. Next, we use proc corr to get the correlation between the outcome variable (achiv) and the predicted value (called p_achiv by default), and use the ods output statement to save the correlation matrix to a data set called corr. Finally, we use a data step to square the correlation (and round it to four decimal places), and output the answer to the output window. The calculated value of approximately .31 is rough estimate of the R2 you would find in an OLS regression. The squared correlation between the observed and predicted academic aptitude values is about 0.31, indicating that these predictors accounted for over 30% of the variability in the outcome variable. You need to be careful about what value is used as the truncation value, because it effects the estimation of the coefficients and standard errors. In the example above, if we had used ll(39) instead of ll(40), the results would have been slightly different. It does not matter that there were no values of 40 in our sample. Greene, W. H. 2003. Econometric Analysis, Fifth Edition. Upper Saddle River, NJ: Prentice Hall. Heckman, J. J. 1979. Sample selection bias as a specification error. Econometrica, Volume 47, Number 1, pages 153 – 161.